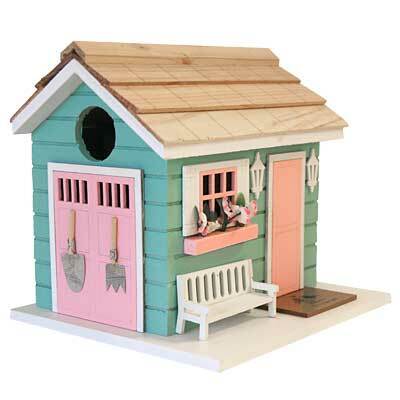 Add a feminine hint and fun motif to your backyard bird garden with this Home Bazaar She Shed Bird House. The traditional, rectangular shape of this home offers a classic roosting spot, while its pastel color scheme and unique accents add a bit of whimsy. Detailing such as a bench, garden tools, and welcome mat bring visual interest to the piece, and the pitched, lapped roof completes the item. Its light green body meshes with your landscaping, while pink doors, window panes, and a flower box offer a bit of contrast. The white, level base, trim, bench, and sconce shapes add realism to the item, while miniature garden tools on one side capture attention. Birds can readily enter the home through the 1.25" diameter opening on one side of the piece, which leads to the generous interior. The roof protects this nesting area from rain, and a hole on the base provides drainage. A ventilation gap runs along the front of the home, cleverly placed beneath the roof overhang, aiding in regulating the internal temperature. Remove the back panel of this unit to check the nest or clean the item, and place it against a wall or post with the attached mounting tab. For a different look, place the level base on a pole or post using a mounting bracket (not included). The wooden body celebrates the natural world, while the soft tones bring a lively hint to the home. Turn a bit of your bird garden into a ladies’ retreat by adding this She Shed Bird House to it. Woodlink Rustic Farmhouse Wrap-Around Squirrel Baffle, 17.5"